Brightly cute colored and impressively charming festive decoration! Add these additional embellishments to wedding reception making it more lively and dimensional. Decorate your own party with paper hanging decorations of different bright colors. Each pom pom comes with white ribbon and instructions. Pre-cut pieces for easy folding each sheet and fluff into shape to create beautiful and realistic paper flower pom-poms. Our tissue paper flowers are hand made using premium paper.They look great for a unique party decoration. 4pcs Dark Blue Pompoms paper flower ( 1x 8inch, 1x 10inch and 2x 12inch ). 4pcs Blue Pompoms paper flower ( 1x 8inch, 1x 10inch and 2x 12inch ). 4pcs Sky Blue Pompoms paper flower ( 1x 8inch, 1x 10inch and 2x 12inch ). Step 1 Unfold the tissue paper to the outside with the edges. The strips of tissue paper are joined together in the finished paper flower. Step 2 Carefully pull the layers of tissue paper apart one by one. Step 3 When all the strips have been pulled apart, make a more round shape with your hand gently. Step 4 Now, hang the paper flower anywhere you want. 12 x Tissue Paper Pom Poms Flowers. Paper hanging decoration set with different bright color; Good for Birthday, Party, Wedding, Home Decoration, Christening Baby shower, graduation, festival, holiday, etc. 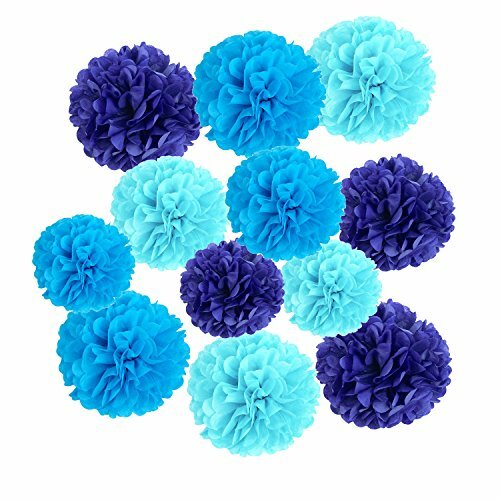 Colorful pom pom flowers: this package includes 3 colors of pom pom flowers: Dark Blue, Blue and Sky Blue, different colors bring some romantic and cozy atmosphere to your party. Quantity: there is 12 pieces of pom pom flowers in the package, they are different in color and size. If you have any questions about this product by Wartoon, contact us by completing and submitting the form below. If you are looking for a specif part number, please include it with your message.